First soak the rice overnight or at least 5/6 hours. And now drain the water and let the rice drained out well. Then grind it in a grinder or coffee grinder. And add the store bought rice flour with it. And now mix some water and milk. Please don’t take too much. Then around 1/3 cup.And add salt, sprinkle water ,milk in a way that the flour must seem wet, not dry at all. It should look like batter. Don’t add the liquid at the time. Need not that much liquid. If the flour binds together if you some of them in your palm, the flour is ready. Must not be dry that it doesn’t hold together . If the flour is ready, then the pitha will break apart. Then now sieve the flour through the strainer. Take 2 pieces of clean cotton cloth and 2 small bowls. And now in the bowl spread some flour, then add the coconut and jaggery. Now cover it with another layer of flour. Please don’t press too much or else, will break down while placing it for steaming. And cover it with a piece of cloth and put in the steamer. Now tap the bowl slightly., so that you can remove the bowl easily. And remove the bowl and cover the pitha with the remaining ends of the cloth. Then steam for 5/6 minutes. Prepare the same way using the other bowl and cloth. Please you remove one pitha and place another. For steaming I don’t have that specific utensil for making vapa pitha. And any steamer will do. You can do more than one at a time. Some times I just take a small saucepan with water and place a large metal strainer or large slotted spoon over it, so that it covers the face of the utensil. And boil the water and steam the vapa pitha on it. You must put the lid on while steaming. 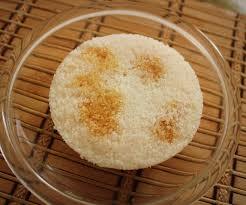 Finally serve this vapa pitha any decorated plate or bowl.